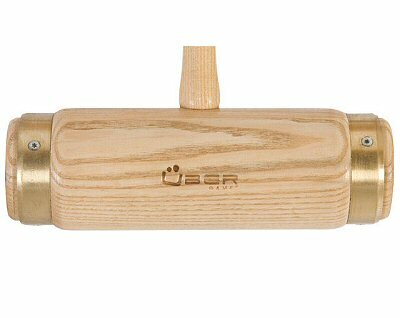 Junior Executive Croquet Mallet from Uber with 28” Octagonal English Ash handle, smaller 8" x 2.5" English Ash Head with protective brass rings, Natural finish, Leather grip, Approximate weight 2lbs. This is the style of mallet supplied with our Uber Executive Croquet Set, but shorter with a lighter head. The Junior Executive Mallets are remarkably good for the price - they have solid octagonal-section English Ash handles, profiled so that they flex in just the way you would want them to, and (amazingly for the price), English Ash mallet heads with protective brass rings. This sort of mallet head is usually found on far more expensive sets and really makes this mallet. The brass rings protect the mallet, reducing substantially the risk of the wood chipping. All in all, our Executive Croquet mallet really is a very good buy.